Jessica Chastain has proven herself a character acting chameleon over the last few years and her ubiquitous presence gives Andrés Muschietti’s feature-length adaptation of his 2008 Spanish-language short Mamá an aura of class that really isn’t warranted. You never know what hair dye the actress is going to be colored from one role to the next, and after her failed previous nomination, Chastain has gotten the Oscar formula down pat. On competing screens in the tony, high-concept, CIA thriller Zero Dark Thirty, for which she’s nominated for the Academy Award, she’s opened wide for more democratic appeal in the audience pleasing shriek fest Mama, about two feral girls whose adoptive parents discover they’ve brought something equally untamed back out of the wilds with them. Having had its release date pushed back to the midst of Oscar season, Mama is riding high on the wave of free publicity generated by Zero Dark Thirty. In a way, this movie itself is an extended ‘for your consideration’ ad that attempts to display the talented Chastain’s full dramatic range. She has a shrewdly transformative role here that allows her to reveal her dark side (literally) by swinging to the opposite extreme of her award-baiting work as a seasoned, polished, professional government agent who has it totally together. Mama presents Chastain as Annabel, a sloppy, foul-mouthed slacker determined to forestall growing up or accepting responsibility. She’s been physically transformed to an impressive degree as well, hardened, tattooed and nearly unrecognizable in a dark black Lulu wig, black nail polish, black eye liner. 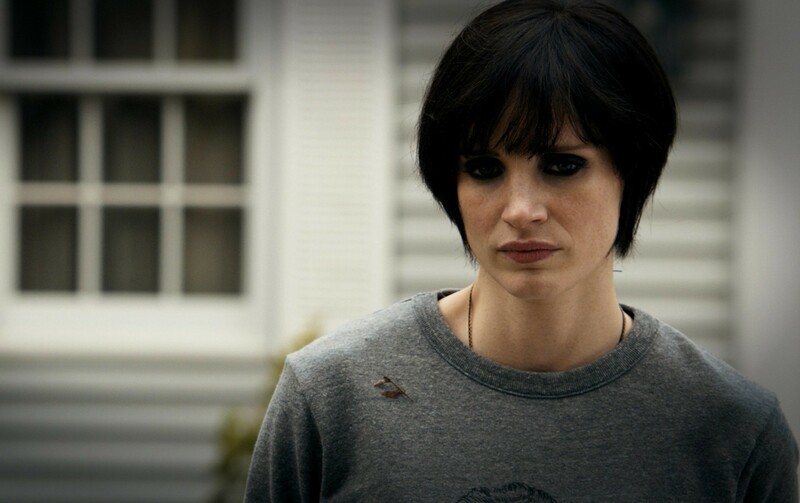 With such suicidal, Goth girl looks, she might be auditioning for Rooney Mara’s role in The Girl with the Dragon Tattoo. It’s no wonder the two children, Victoria and Lilly, mistake her for Mama initially. She looks like death warmed over herself. And her response to their confusion is to take offense, defensively snapping “Don’t call me that. I’m not your mother.” If she’d bothered to tack on “Go back to hell where you belong, spawn of Satan,” it wouldn’t have been a shock. This rocker chick is still a wild child herself and far from ready to be responsible for anyone much less a child, as she’s fully aware, thanking God on the loo after her home pregnancy test comes up negative. When the girl’s uncle Lucas asks Jean, the maternal aunt who’s contesting custody, how many girls she’s raised and she sneers “Not as many as you,” it’s a backhanded insult aimed at Annabel. She’s meant to be seen as immature because she still plays in a rock band, entertaining her childish dreams of glamour, fame and stardom, same as Lucas draws for a living. The way this film would have it, their bohemian existence is a sign of irresponsibility, tagging them as unfit parents, an odd theory for a film crafted by other artists to advance. According to Mama, the only fit parents are those who subscribe to suburban tract conformity, with 2.2 kids and a dog in front of the proverbial white picket fence. And the movie never seriously addresses the possibility that Lucas and Jean’s fight for custody of the girls might have anything to do with maintaining control over their father’s fortune, of which they’re now the sole heirs. The story could easily have been expanded into a variation of Anastasia, to accentuate its lost princess/fairytale motifs. The dramatic subtext of the movie has to do with Annabel’s gradual maturation, her learning to become a decent guardian for the girls as she becomes more domesticated and respectable. Giving up her rock band dreams to head off into suburbia with Lucas and the girls, she trades in her badass electric air guitar for laundry baskets and shopping carts, conditioning herself physically and preparing herself mentally to become the perfect housewife and mother. Her inner wild child becomes as tame as the increasingly civilized oldest girl, Victoria, and the movie is structured like an extended trial by fire for her upcoming recasting in the role of soccer mom. 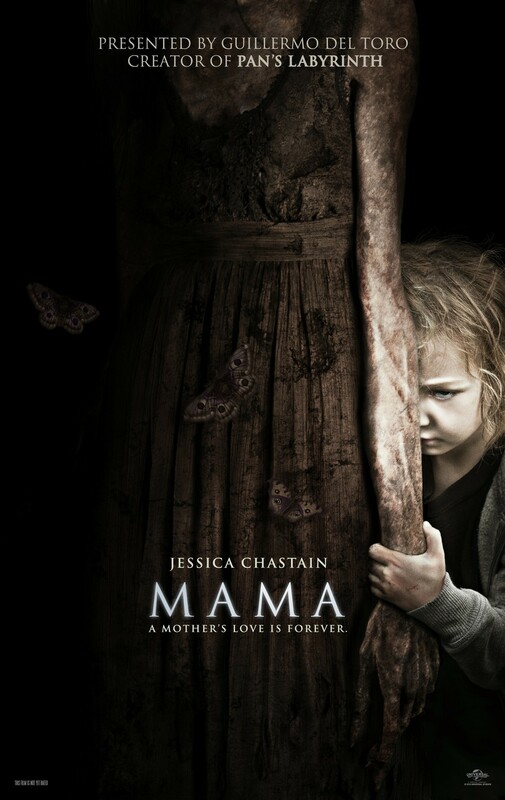 Argentinean director Andrés Muschietti served as set production assistant during location filming of Evita way back in 1996, and as assistant director on several Spanish-language films, but Mama is his first major Hollywood release. Apart from two previous shorts, Nostalgia en la mesa 8 and Mamá which sketched out the scariest scene that’s repeated verbatim here, this is his first feature-length directorial effort ever, and the mentoring imprint of established Mexican director Guillermo Del Toro, who served as executive producer, is readily apparent. Indeed, the film feels more profoundly influenced by Del Toro than anything Muschietti has turned out thus far, and that seems to justify his name being plastered over so much of the marketing that one would be forgiven for believing he directed the thing himself. Imitation is the sincerest form of flattery and Mama is as blindly loving an homage to Del Toro as Super 8 was to Spielberg last year. 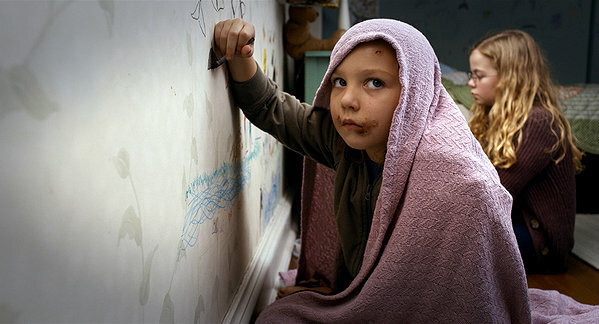 Like many of Del Toro’s movies, Mama also hovers around the supernatural theme of kids menaced by spectral entities, as well as being rooted in the childhood trauma of broken homes and recombinant families, much as were, to varying degrees, Cronos, The Devil’s Backbone, Hellboy, Pan’s Labyrinth, Don’t Be Afraid of the Dark for which Del Toro contributed the adaptation, and The Orphanage, which he produced. Appropriating the same broken home theme Del Toro so frequently treats on film, the ‘once upon a time’ preamble Mama begins with seems quite apt for a oedipal fairytale about wicked stepmothers. For the better part of the movie, Annabel is saddled with the burden of being a ‘single parent,’ unfairly left bearing the brunt of the child rearing responsibilities. So we can understand her pain and hurt when Lucas unthinkingly declares that it’s his orphaned nieces who are the most important things in the world to him. Shunted into the unfamiliar new role of parental bad cop, the disciplinarian and rule enforcer, formerly rebellious bad girl Annabel playfully joshes Lucas for being the ‘cool uncle,’ who gets the easy job of merely having to swan in and play with his nieces to win their undying affection. When he wakes from his coma and asks her, as she wraps herself snugly around his legs like a contented house cat, how life has been as a single mother, she smirks “Oh it’s great,” mouthing under her breath and out of the girls’ earshot the actual truth, which is that they hate her. Yet she must take on the nurturing role, willingly or not, and along the way discovers her own mothering instincts, and a more domesticated outward appearance to match, slipping into a conservative sweater to cover those untoward tats, evidence of her wilder days. As the girls slowly start winning Annabel over, we feel her biological clock winding and watch her transform into the ideal mama. Where before she had been comically inept and uncaring when tucking the kids into bed, she becomes more sympathetic, even reaching the younger girl by blowing on her freezing hands after she’s been exposed to the elements all night. In effect she’s putting the breath of life back into her, as stepmother Maureen Stapleton did resentful Mary Beth Hurt at the end of Interiors, symbolically giving life to her a second time over, legitimizing her new status as the girl’s mother. Given its wild child theme, I was expecting a conception of Mama with a tad more heft, something feral, earthy, the mothering instinct as an elemental force of nature. Instead, when Mama moves in it’s like a bad case of dry rot, similar to what happened to that new development in The Apparition. Her evil is like a blight that infects everyone it touches. Moving about as if every joint in her body had been snapped, twisted or turned backward, she’s a sentient weeping willow, and the influence of Asian ghost stories on her conception and design is obvious. Her arrival is even anticipated by the sight of her tangled mess of inky hair snaking into view, each strand writhing like coils of Medusa curls. This weave detaches itself from Mama’s scalp and goes swimming around the floor angling toward its latest victim like some squid-like swath of seaweed. She’s an elongated El Greco painting, melting from the neck down, but surprisingly the special effects used to animate this moth-eaten conception of the vengeful, hungry ghost are vaguely disappointing. They look almost hand drawn at times, like one of the children’s doodles come to screeching life. We’re given a ghost whose gracefully fluid movements are nearly balletic, beautiful in their ghastliness, not unlike watching elegantly choreographed water ballet. This wavy wraith looks as if she were still submerged and the motion of her ocean is quite lovely to look at. Her billowy banshee, together with the cliff peak climax, so blatantly evoke Tim Burton’s recent, regrettable Dark Shadows, I’d be loathe to say it were simple coincidence. Muschietti makes the rookie mistake of continually pushing the apparition in our face however, exposing her to the harsh, revealing light when concealing shadows, such as those exploited nearer the beginning, would probably have made the jolts more effective. I would have been satisfied if he’d kept us guessing about the true nature of the haunting. If Mama had been presented more logically, as a precognitive elemental, the embodiment of the mothering instinct in nature, which can turn so ferocious when its cubs are threatened, it would’ve made more sense and been far more terrifying. The movie seems to poke around at this possibility, having the ghost emit moans and bellows like a wounded water buffalo at times, and at others schizophrenically change faces whenever veering between her wild instincts and her human nature, but the idea isn’t really fleshed out. As is, we have no idea why the girls were scuttling around on all fours, behaving like animals as if they’d never been touched by human hands, when they had this elegantly refined apparition fluttering around with her butterfly wings as a role model of poise and deportment. It’s not likely the possessive, smothering Mama would have allowed the girls to be taken away from her after they were located, and one can’t help wondering why she prevented their father from killing them if she was just going to do the deed later herself. The archivist who serves as harbinger here says “a ghost is an emotion bent out of shape,” telling us her words apply directly to Mama, whose jutting, angular bones appear all backward and broken and upside down, that it is “…condemned to repeat itself over and over until it rights the wrong that was done.” Yet I can’t fathom how murdering another child is going to help Mama’s spirit rest in peace, as she dresses the girls like maidens fit for sacrifice in floral wreaths. She should already have the soul of the other baby she killed to keep her eternal company anyway. Stories of abandoned children raised by a whole menagerie of different animal kingdoms- wolves, gazelles, apes, lions, dogs – are legion, and Mama takes these reports as a starting point, offering up a highly unusual riff on the theme. There was nothing of this in Muschietti’s original short, so the draw of this idea for him must have been rooted elsewhere. Much like Greystoke- The Legend of Tarzan, The Jungle Book, and Francois Truffaut’s The Wild Child, Mama begins life as a psychological study of feral children, even if these two kids have been raised by a very human ghost. When we first meet up with the two creepy kids after they’ve responded to the call of the wild and been regressed to their animal state, they’re imitating a quadruped, matted hair falling in their face like a filthy coating of fur. Though why Mama chooses to provide her particular manna is never explained (it couldn’t have any sexual connotations), they’ve also been collecting the discarded pits from the cherries they subsist on to construct a nest. The girls behave as if they’d spent their entire lives outdoors rather than in the relative safety and security of an abandoned cabin, and the movie’s most unsettling starts arise from their bestial behavior and supernatural swiftness, unexpectedly popping up in places where they aren’t expected, such as tabletops every time the lights go down. Equally unsettling is the way they configure themselves into that weird formation atop the cabin fridge and just sort of sway back and forth like lowland gorillas about to pounce. Sleeping with their head on their knees and their lids wide open, catching refractive eye shine like predators, Victoria and Lilly have learned to uncannily imitate the movements of Mama whenever she’s agitated, holding out their jutting bones and akimbo limbs at sharp angles. They look downright inhuman, more like giant insects than mammals, moving about in a way that gives them the appearance of a spider or crab; recalling Linda Blair’s notorious crabwalk in The Exorcist. So when their uncle enters their bedroom at the psych institute where they’re under observation, with the intention of sparking memories of their prior life, it’s as if he were being sent into the lion’s den. In some ways the girls recall the uncivilized backwoods twins played by Jodi Foster in Nell and for her part, Annabel’s attempts to reach the feral foundlings may remind you of Annie Sullivan’s efforts to communicate with Helen Keller. Lilly was taken away so young she hasn’t been as socialized as the older girl, which is why she proves resistant to being civilized. In many ways she functions like Victoria’s shadowy animal spirit, gnawing on her hair for nutrition, eating bugs, taking her meals on the floor like a pet rather than at the table, and sleeping under her bed instead of in it, just as Mama does in Annabel’s nightmare. It’s only the glasses that allow Victoria to adapt, reminding her of the life she once led, reaching the civilized soul within. The glasses are her only living link to civilization, the reason she can be drawn back where her sister can’t be reached. It’s why she removes them when she’s around Mama, taking them off before she goes in to play, or risk incurring her wrath. Yet the glasses tic us off for a different reason than they do the apparition; rather than evoking our sympathy, for some reason the specs impart the unfortunate impression that this icy little girl is deceptive and not to be trusted. I guess there’s truth in the old saying about girls who wear glasses. The unethical child behavioral psychologist who takes charge of the girls, Dr. Dreyfuss, regards them less as human beings than as a fascinating case study, examining them as lab specimens under carefully controlled conditions. It’s a wonder he doesn’t install around the clock, 24-hour surveillance, which would at least serve to catch on camera some of the paranormal activity he’s seeking evidence of. And after the film’s interest in the feral child element begins to lag, the doctor’s continuing voiceover, in which he types out his compiled notes, feels out-of-place, as does the entire tangent the story goes off on, with him returning to the girl’s former haunt. It becomes a substory, and feels like unnecessary padding, addendum. Creeping around in the shadows with his flash bulb, he’s trying to find proof to support his allegations of paranormal phenomenon, same as Jean is looking for hard evidence to back up her unsubstantiated charges of abuse. But, there’s no real attempt to array their coldly empirical, scientific and judicial methods directly against the irrationally emotional, wild instincts embodied by Mama and her girls. Consequently, Mama devolves into your standard, stereotypical thriller, overstressing the clichéd horror elements at the expense of exploring its genuinely fascinating premise, which just sort of falls by the wayside. This is a shame since the feral child element could’ve added that extra special something to make Mama so much more rewarding than your standard fright fluff. Like their artist uncle, the girls instinctively draw, doodling sketches all over the walls that give us insight into their disturbed psychological states. Their shrink believes they created an imaginary guardian as a coping mechanism when abandoned in the wilds, then later conjectures that their continuing reliance on Mama after being returned to civilization is evidence of a dissociative disorder. It’s theorized that Victoria may be taking on the role of mama herself, and from what we can see of it, this may very well be the case. Having already taken on the mothering role with her younger sibling, Mama embodies all the wild, unstrung emotions Victoria is powerless to express, being the increasingly civilized girl she is, just as the younger Lilly represents the uncivilized shadow ID she must put behind her as she assimilates back into society. Apart from her unprovoked attack on Lucas, who may remind her too much of the father who tried to kill her before abandoning the girls in the woods (both parts are played by Nikolaj Coster-Waldau, to emphasize the resemblance), all the people Mama targets (the shrink, for example, and Jean) are people Victoria sees as a threat, or pointedly wants out of her life. 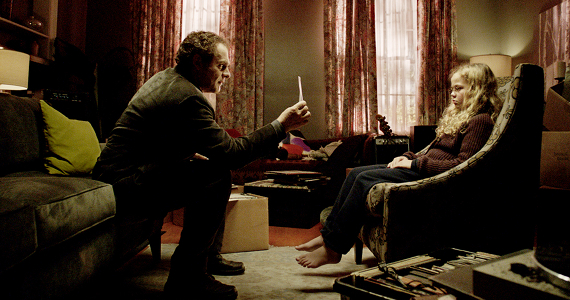 Mama isn’t acting on her instincts, but rather on Victoria’s. The fact that Victoria doesn’t want Annabel to get hurt now that she’s accepted her as a replacement mother figure, is the major reason she survives. The other reason is that Annabel herself shares a strong, subconscious bond with Mama. She too possesses a wild, unstrung side that she tries to control, one that serves to place her on equal footing with the specter she squares off against. Clutching the drawstring of Victoria’s robe, same as she had earlier, refusing to let her go with all the fierce determination of her newly discovered nurturing instinct, the strength of Annabel’s implacable will when her young ones are threatened even impresses the demoniac wraith. Only a woman with her own wild side could cross swords with a feral phantasm like this and emerge relatively unscathed. She proves Mama’s match, clearing the path for the climactic big mama smack down. And as new mama squares off against old mama for sovereignty, I couldn’t help but be reminded of the beyond this world mother love capper to James Cameron’s Aliens. 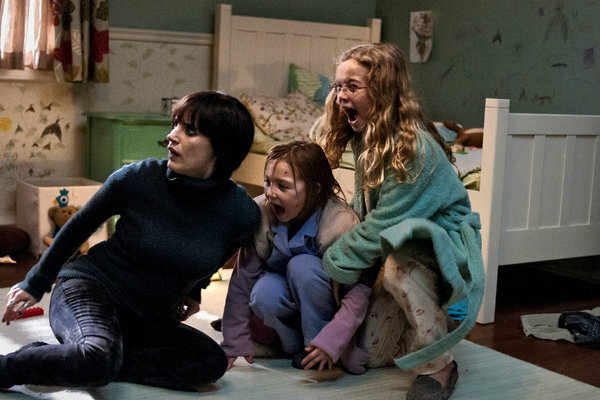 This entry was posted in Thriller and tagged adoption, Andrés Muschietti, Best Actress Academy Award 2012, bohemians, Dark Shadows 2012 movie, Don't Be Afraid of the Dark 2011 movie, feral children, ghosts, Guillermo Del Toro, Isabelle Nélisse, Jessica Chastain, Mama 2013 movie, Mamá 2008 short film, Megan Charpentier, mother love, mothering instinct, Nikolaj Coster-Waldau, possessive mothers, rock bands, special needs kids, stepmothers, The Wild Child 1970 movie, unfit parents, Zero Dark Thirty 2013 movie. Bookmark the permalink.